Posted on May 28, 2017 by burkely.twiest@noaa.gov. The above image says that the area to the east of the 19Z line will see its most severe weather from 1900 UTC – 2300 UTC, and the areas east of the 23Z line will see the peak severe weather from 2300 UTC – 0300 UTC the following day. Ideally, these lines will be displayed on the 15% threat area (the “slight” risk equivalent) to determine the eastern bound of the final line – currently participants and the NSSL desk lead have this forecast as a background when drawing their isochrones. Intuitively, it doesn’t seem like the 21Z isochrone should be so far into the 21Z hourly coverage area. However, last year the isocrhones were approximately an hour late, and the current thinking is that participants were circling the peak of the distribution at a point without accounting for the ramp-up. 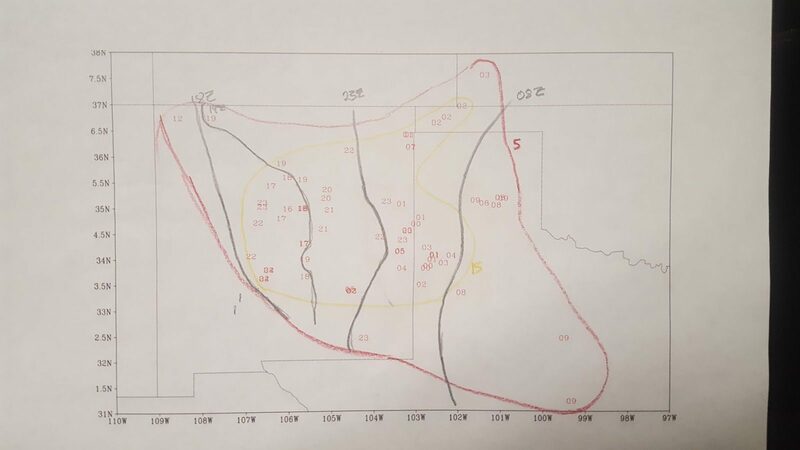 In other words, the area circled by the 21Z contour likely started experiencing the ramp-up in probability of severe weather starting at around 20Z. 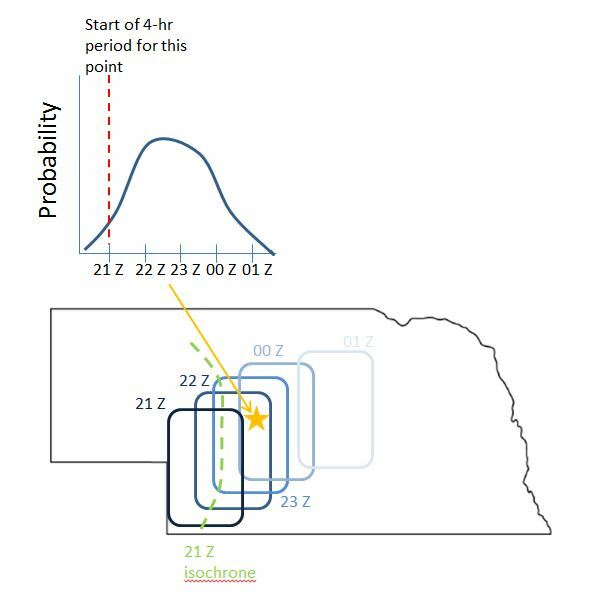 So to forecast the isochrones, participants need to take into account multiple forecast challenges such as convective initiation, the onset of severe weather, system speed, system maintenance, and the potential for later redevelopment. In the case of redevelopment, participants have to select which four-hour period will contain most of the severe reports. If the redevelopment occurs within four hours of the initial convection, the four-hour period that encompasses both waves is the four-hour period that should be assigned to that point. If it is further, then they must select which period will be most severe. To better understand the isochrones (since they take a while to wrap your brain around! ), SFE 2017 has explored multiple ways of visualizing them in addition to schematics. 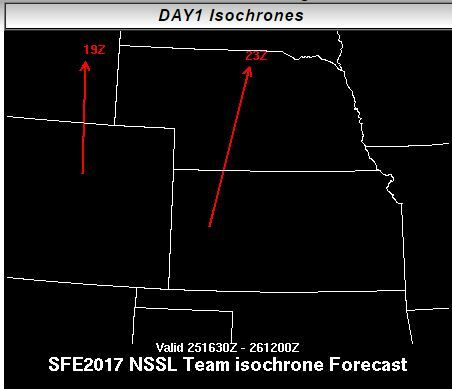 One method uses first-guess isochrones derived from ensemble guidance, such as these isochrones for 27 May 2017 from the NSSL-WRF ensemble. This scenario forecasts early convection across Iowa and Colorado, with later convection occurring across much of Oklahoma and Arkansas, slowly pressing eastward and ending the forecast period in Georgia, Tennessee, and Alabama. 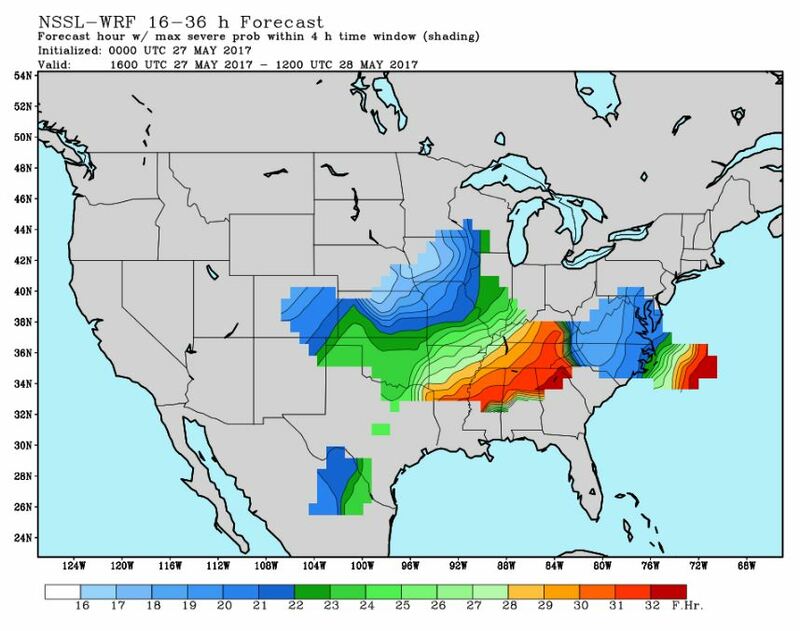 A second wave initiates in Virginia and North Carolina before moving offshore in the later periods of the forecast. 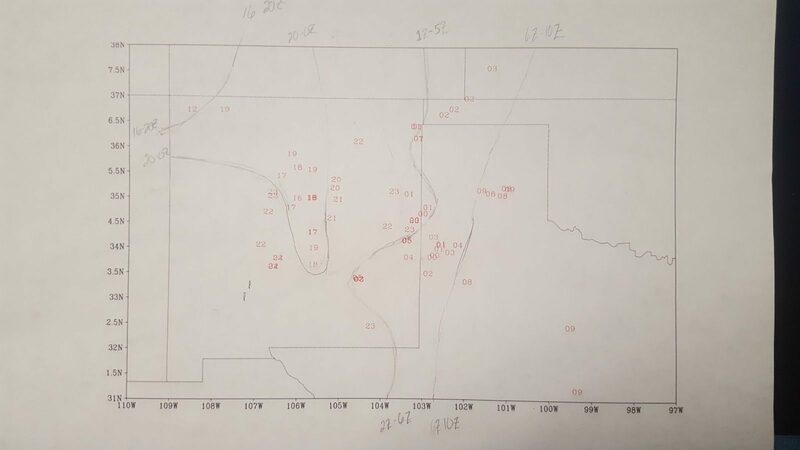 Participants have also attempted to draw ex post facto isochrones using the reports from two separate events. These isochrones can be messy, particularly in cases where storms didn’t produce reports at similar times, as can be seen in these examples from 9 May 2017. The first example here shows a participant who ischroned every hour, then went back and looked at what four-hour periods would be best representative of the reports, resulting in the erasing of some lines and the adjustment of others. The second example shows how the overall area of report occurrence (which is about the 15% contour) serves as a template to draw the isochrones upon. As with any hand analysis, the specifics differ, but the overall story told by these ex post facto isochrones tell a similar story. As the experiment progresses, the isochrones continue to be a challenging product for the participants to produce. However, the participants are always game to try these experimental forecasting techniques, and have provided great feedback to improve the training and the future implementation of the product. Isochrones may be a slippery concept, but our participants have proven themselves up to the challenge!